Honda Motor Co today began sales in Japan of its all-new fuel cell vehicle (FCV), the Clarity Fuel Cell, challenging rival Toyota’s Mirai fuel cell vehicle. Striving to realize full-fledged popularization of FCVs, Honda created Clarity Fuel Cell as an FCV featuring both a high level of practicality that represents the “universal value” of an automobile and “cutting-edge appeal” that is suitable for a vehicle that is at the forefront of the times. Combined with the improved efficiency of the powertrain and a reduced energy requirement for driving, a 70 MPa high-pressure hydrogen storage tank installed to this vehicle provides a cruising range of approximately 750 km (466 miles), an increase of approximately 30% compared to the previous FCV model, to achieve the world’s top-class cruising range among all zero emission vehicles. The Clarity Fuel Cell has a longer range than the Toyota Mirai, the world’s first mass-produced hydrogen vehicle, which can cover around 650 km (373 miles). This increase in cruising range significantly improved the practicality of this FCV model as an everyday car which can accommodate all driving needs from everyday use to a long-distance driving trip. The hydrogen tank can be refilled in approximately three minutes, realizing ease of use equivalent to that of a gasoline-powered vehicle. Moreover, as part of its “cutting-edge appeal,” the Clarity Fuel Cell features an exterior design which combines dynamism and elegance as well as a quiet yet powerful and smooth driving feel which can be realized only by an electric vehicle equipped with a high-output motor with maximum output of 130 kW. In addition, in combination with a portable external power output device, the Power Exporter 9000, which also went on sale today, Clarity Fuel Cell can function as a “power source on wheels” that is capable of supplying approximately seven-days’ worth of electricity for an average household. For the first year of the Clarity Fuel Cell launch in Japan, Honda will focus on lease sales mainly to local government bodies or businesses Honda has already been working with for the popularization of FCVs. 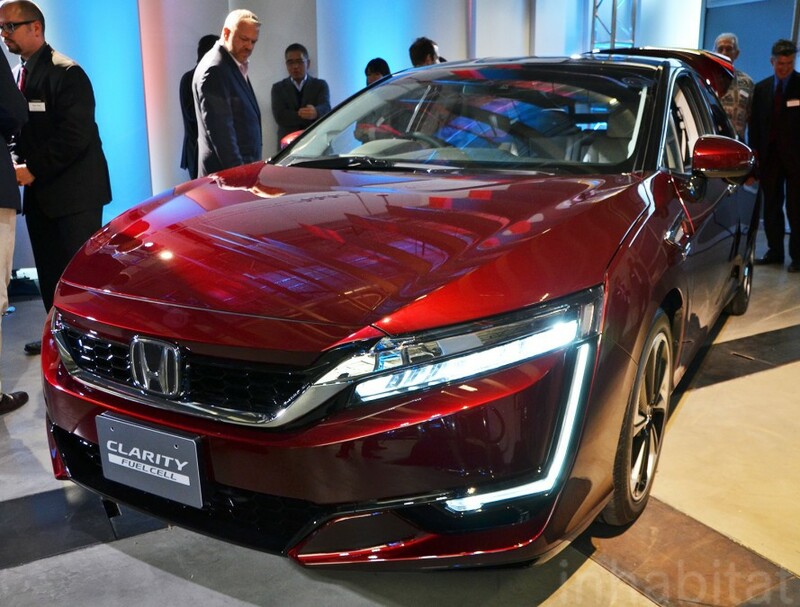 During this period, Honda will collect information about the in-market use of the Clarity Fuel Cell as well as the external power output device and gather diverse opinions and requests from customers and other relevant organizations, and then later begin sales to individual customers. Honda will begin with small-volume production at the Production Supervisory Unit and Powertrain Production Supervisory Unit (located in Takanezawa-machi, Shioya-gun, Tochigi, Japan. ), eventually expanding production volume. Moreover, Honda is planning to introduce the Clarity Fuel Cell to Europe and the U.S. before the end of 2016.